The official cause of the Thomas Fire, which burned nearly 1,000 homes in Ventura and Santa Barbara counties last December, has still not been officially announced. 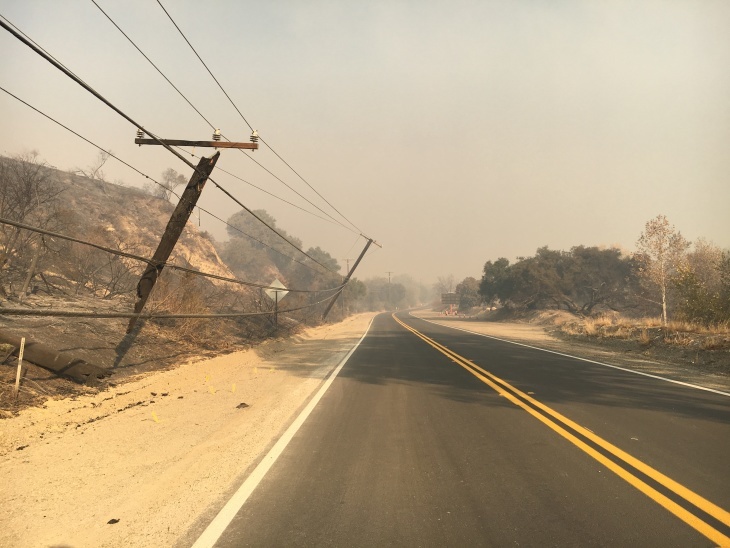 But this week, Southern California Edison said its equipment was involved in the fire at one of the two known ignition points, near Santa Paula. It stopped short of accepting the full blame however, saying that it hasn't been able to do a full investigation, because Cal Fire had confiscated utility equipment such as power poles where one portion of the blaze had started, along Koenigstein Road in Santa Paula. Several lawsuits have already been filed against SCE alleging its power lines sparked the fire. SPECIFICALLY, WHAT HAS SOUTHERN CALIFORNIA EDISON SAID? Pedro Pizarro, CEO of SCE, parent company Edison International, made the announcement Tuesday during a quarterly investors conference call. He complained that Cal Fire was not permitting SCE's own fire investigators to view the confiscated equipment. "Cal Fire has pieces of evidence that we don't, and they may come up with conclusions that, in the end, we may agree with or may not agree with," Pizarro said. For that reason, he said the company could not conclude that its equipment was actually at fault. The company did not address whether its equipment was involved in the other ignition point, near Anlauf Canyon Road in Santa Paula. WHY IS SCE DISCLOSING THIS NOW, BEFORE OTHER INVESTIGATIONS ARE CONCLUDED? The Ventura County Fire Department is still investigating the fires with several other agencies, and none has announced an official cause. Pizarro said SCE had not made the announcement to get ahead of fire officials, but because its investigators had taken their inquiry as far as they could without having access to the confiscated equipment. He said he felt the information should be shared with investors and the public. Pizarro and another executive said the company was likely to record a loss due to its equipment's role in the Thomas Fire and that it was still unclear whether the company's $1 billion in insurance could cover the loss, or whether any of it would be passed on to investors or even to customers. Because there are two ignition points, it's also unclear what portion of financial liability for the fire would be assigned to Edison if it were found to be responsible for one ignition point, and not the other. WHY IS IT SO IMPORTANT TO PINPOINT THE EXACT CAUSE OF THE FIRE? It matters because Edison customers could be on the hook for billions of dollars in damages if state fire investigators and utility regulators rule the company's equipment was at fault. But if it was caused by negligence, the money could come out of shareholder profits. Under California law, a utility must pay all the damages from a fire that its equipment causes (and its shareholders must pay in case of negligence).The legal principle is known as "inverse condemnation". Edison and other big utilities in California wanted to overturn that principal during the last legislative session. They failed, but the law that did get passed, SB901, creates a new Catastrophic Wildfire Cost and Recovery commission that will examine ways to "more fairly allocate risks associated with increased wildfires," SCE spokesman Steve Conroy said.